Patrick J. Stover, Ph.D. is a Courtesy Professor in the Division of Nutritional Sciences at Cornell University. He graduated from Saint Joseph’s University with a BS degree in Chemistry and was awarded the Molloy Chemistry Award at graduation. He received a PhD degree in Biochemistry and Molecular Biophysics from the Medical College of Virginia and performed his postdoctoral studies in Nutritional Sciences at the University of California at Berkeley. The Stover research group studies the fundamental chemical, biochemical, genetic and epigenetic mechanisms that underlie the relationships among nutrition, metabolism and risk for birth defects, cancer and neurodegenerative diseases. We focus primarily on the B-vitamins folate and vitamin B12, their influence on nuclear and mitochondrial one-carbon metabolism, their downstream effects on cellular methylation, gene expression and genome stability, and their role in preventing human pathologies. 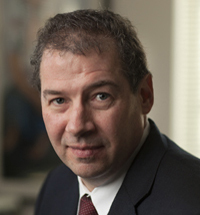 Patrick Stover was elected into the National Academy of Sciences in 2016. In 2014, he was elected as a Fellow of the American Association for the Advancement of Science. He received the SUNY Chancellor's Award for Excellence in Scholarship and Creative Activities and the Osborne and Mendel Award for outstanding recent basic research accomplishments in nutrition from the American Society for Nutrition, and a MERIT award from NIDDK-NIH. In 1996 he received the Presidential Early Career Award for Scientists and Engineers from President Clinton, the highest honor bestowed by the U.S. government on outstanding scientists and engineers beginning their independent careers. He received the ERL Stokstad Award in Nutritional Biochemistry from the American Society for Nutritional Sciences and has been selected as an Outstanding Educator four times by Cornell Merrill Presidential Scholars. He is editor of the Annual Reviews of Nutrition. Our research program investigates the fundemental mechanisms underlying the regulation of folate-mediated one-carbon metabolism and its role in mitochondrial and nuclear genome methylation and stability. Ongoing projects include the role of folate and vitamin B12 in nuclear de novo thymidylate synthesis, and its impact on human pathologies including neural tube defects, colon cancer, and neurodegenerative disorders. Palmer, A.M., Kamynina, E., Field, M.S., and Stover, P.J. 2017. Folate rescues vitamin B12 depletion-induced inhibition of nuclear thymidylate biosynthesis and genome instability. Proc. Natl. Acad. Sci. 114(20): E4095-E4102. Misselbeck, K., Marchetti, L., Field, M.S., Scotti, M., Priami, C. and Stover P.J. 2017 A hybrid stochastic model of folate-mediated one-carbon metabolism: Effect of the common C677T MTHFR variant on de novo thymidylate biosynthesis. Sci Rep. 7(1):797. Martiniova, L., Field, M.S., Finkelstein, J.L., Perry, C.A., and Stover, P.J. 2015. Maternal dietary uridine causes, and deoxyuridine prevents, neural tube closure defects in a mouse model of folate-responsive neural tube defects. Amer. J. Clin. Nutr. 101(4):860-9. PMC4381776. Nesheim, M., Stover, P.J., Oria, M. 2015. Healthy diet sustains the environment too. Nature 552: 287. Stover, P.J., MacFarlane, A.J., Field, M.S. 2015. Bringing clarity to the role of MTHFR variants in neural tube defect prevention. Am. J. Clin. Nutr. 101(6):1111-2. Stover, P.J. 2014 Building and maintaining public confidence in nutrition science. Sight and Life Magazine 28(2) 66-67. MacFarlane, A. and Stover, P.J. 2016. Gastrointestinal Disorders: Overview. Encyclopedia of Public Health. International Encyclopedia of Public Health Second Edition, vol. 3 pp. 9-19. Bailey, L.B., Stover, P.J., McNulty, H., Fenech, M.F., Gregory, J.F. 3rd, Mills, J.L., Pfeiffer, C.M., Fazili, Z., Zhang, M., Ueland, P.M., Molloy, A.M., Caudill, M.A., Shane, B., Berry, R.J., Bailey, R.L., Hausman, D.B., Raghavan, R., Raiten, D.J. 2015. Biomarkers of Nutrition for Development-Folate Review. J Nutr. 145(7):1636S-1680S. Finkelstein JL, Layden AJ, Stover PJ. 2015. Vitamin B-12 and Perinatal Health. Adv Nutr. 15;6(5):552-63. Ohlhorst, S., Russell, R., Bier, D., Klurfeld, D., Li, Z., Mein, J., Milner, J.A., Ross, C., Stover, P., Konopka, E. 2013. Nutrition Research to impact food and a healthy lifespan. Am J Clin Nutr. 98(2):620-5. Stover, P.J. 2013. Nutrient-Genome Interactions. In Handbook of Vitamins, Fifth Edition. Chapter 16. (Janos, Stover, Gregory, eds). Taylor and Francis Group, LLC. Learning is achieved and sustained most effectively as a never-ending social activity, whether it be through the engagement of formal courses, original research, mentoring, and through all worthwhile pursuits. 1 How College Works. Daniel F. Chambliss and Christopher G Takacs. Harvard University Press, 2014.